One week’s worth of NFL predictions are in the books, but that means we’ve only just begun, as the Carpenters once sang. As carpenters often do, there’s plenty more wood to chop as well as games to pick throughout the 2018 season. The Ravens’ defense came out stifling against the lowly Bills, and this week, they will cool off the Bengals. Andy Dalton tends to struggle at home in primetime games, and Cincinnati’s run defense issues without Vontaze Burfict will be more prevalent against Baltimore on a short week. The Ravens will take control of the AFC North with Alex Collins playing the closer role. The Vikings should expect Aaron Rodgers to play in another early NFC North game at Lambeau Field. Rodgers and Kirk Cousins have had good duels in the past, and they’ll have another here. Both defenses will have their moments, but a red-hot Rodgers will be motivated to take down the division rivals who essentially ended his 2017 season. The Patriots learned from their comeback playoff win over the Jaguars’ Sacksonville defense last season. They will have Tom Brady fire quick throws to the middle of the field often and use tight end Rob Gronkowski’s mismatch ability to make Jalen Ramsey a non-factor outside. Jacksonville needs a healthy Leonard Fournette to have a chance, as New England’s defense will be better prepared for the short-passing game plan with Blake Bortles. Nathan Peterman has done his best to shake off the nightmare game he played against the Chargers last season, but now the QB has less help from his receivers, offensive line and running game. (UPDATE: Peterman will be on the sideline Sunday; rookie Josh Allen will start in his place.) The Chargers’ pass defense will rebound from their loss to the Chiefs. Philip Rivers and LA’s entire offense will stay hot enough to pull away from Buffalo. Neither Cam Newton nor Matt Ryan passed well in Week 1, but these fast, furious defenses were flying over the field. The Panthers’ new offense is a work in progress, while the Falcons’ old offense continues to stall. As both running games are contained, the game will come down to which team has the biggest playmaker in the passing game. That would be Carolina nemesis Julio Jones. The Saints’ defense is off to a bad start, and the Browns’ new-look offense presents another tricky test. Tyrod Taylor with a few big pass plays will keep Cleveland hanging around early in the game, but Drew Brees and Alvin Kamara will have their way with Gregg Williams’ defense and create a cushion in the second half. The Titans’ good vibes with new coach Mike Vrabel and offensive coordinator Matt LaFleur have been curbed by the loss of Delanie Walker for the season. Taylor Lewan and Marcus Mariota also got banged up. Dion Lewis, however, appears to be a great get, and the Texans are coming off a game vs. the Patriots in which they struggled against the RBs. Houston being short on weapons and protection for Deshaun Watson will cause it to fall short again. Andrew Luck looks healthy and comfortable in a new, high-percentage passing offense, but he’s still working with with a shaky running game and a leaky defense. The Redskins came out complete in Week 1 with Adrian Peterson making things easier for Alex Smith. Washington will need to grind a little more to win this game, but it will use its weak early schedule to reach 2-0. Sam Darnold was strong in Monday night’s rout, but the Jets also proved their QB’s supporting cast — backs, receivers, line and defense included — is better than it appeared at first glance. The Dolphins won ugly over the Titans despite uninspiring play from Ryan Tannehill. “New Jack City” will keep rolling. Who knew Nick Foles vs. Ryan Fitzpatrick would be a real matchup in Week 2? The Eagles’ defense will come through with another strong performance while Foles, Jay Ajayi, Nelson Agholor and Zach Ertz find favorable matchups against the Bucs’ defense. Philly fans will make the trip to the Pirate Ship to make it special. The Cardinals’ defense is adjusting to a new scheme with players in different positions. Their offense is adjusting to a more conservative approach and questionable play from Sam Bradford. The Rams have no questions about either side of the ball. The LA express will go on. The Raiders in Week 1 were not as bad defensively without Khail Mack as many thought they would be, but they were shockingly worse offensively with Derek Carr and Jon Gruden. The Broncos’ defense will not give them a break. Denver will dash out to a 2-0 record with early control of the AFC West. The Giants’ offense is loaded with exciting skill players. The Cowboys’ offense has only one at the moment, Ezekiel Elliott. This game comes down to which team can win on both lines, and Dallas, even with its injuries, has better continuity and stability in that area. 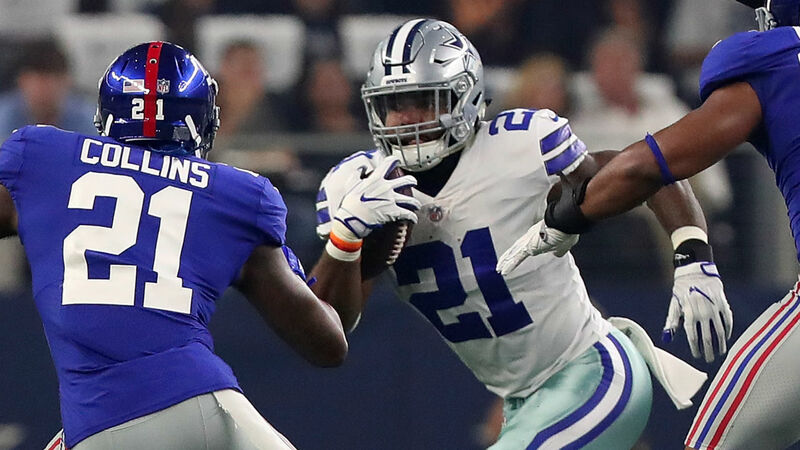 Elliott will outrush Saquon Barkley, and Dak Prescott at home will not make the mistakes Eli Manning will make on the road. Wilson now has to adjust to playing without Doug Baldwin after adjusting to life without Paul Richardson and Jimmy Graham. The QB will keep trying to get the job done with whoever’s around him, but against Mack and the Bears’ front, it’s all on Wilson in the face of pressure with, again, no traditional running game. The Seahawks’ run defense is awful, and the Bears will ride Jordan Howard to victory.